When people are searching for "mortgage calculator" they are looking for answers. What are the questions the typical borrower has? How Long To Pay The Loan Down? Most mortgage calculators make the answering your question needlessly complex. They ask for information that helps them and not you. That's why we created this easy to use and mobile friendly Mortgage Repayment Calculator! Enter the interest rate and answer two of those questions and you'll find the answer to the third one. Use sliders to select your home loan interest rates, how much you are borrowing or what monthly/biweekly payments you can afford and repayment time in years. If interest rates are not round number, or you want to borrow more than the range of the slider, please use text boxes above the sliders to enter desirable amount. 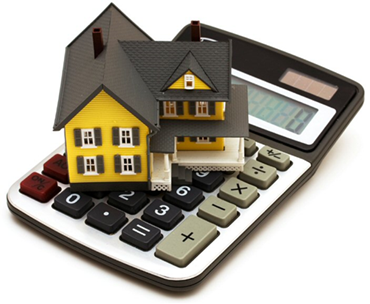 The Home Loan Calculator assumes that the Interest rate does not vary during the period of the Home Loan. In accordance if your Home Loan is based on a Variable Rate, then this would mean that as market conditions change, then so does your interest rate, and the amount of your regular payment. The Mortgage Calculator assumes that the year comprises of 364 days and not 365 days and further does not take into account leap years within the Home Loan period. Further it is assumed that all months are equal and do not vary. This would affect the interest charged on the Home Loan, and vary the end result. The Mortgage Repayment Calculator provides results on regular monthly or fortnightly payments. This would mean that there would be a slight variation to the end result as interest is calculated daily. Loan Borrowing Calculator - could be perceived as somewhat trickier calculator that after entering repayments that you can afford, frequency that you would choose to do so, interest rate and length of loan would determine maximum the amount that you can borrow. Why this calculation is thought to be more complicated? Simple answer is that to define the repayments that one will be financially comfortable with, one has to have basic budgeting knowledge. That is the main reason why so many borrowing calculators you can find by simply using google do look complicated and require answering to questions like: “what are your living expenses”, “do you have other financial commitments” etc. Some experts call it needless information gathering and fear mongering - borrowing calculator should be a mere play with numbers to find out a rough borrowing amount (so that you can start looking at the houses you can afford), but not a loan application process itself. Loan Repayment Calculator that should easily answer your question about how much your repayments be. All you need is amount that you are thinking of borrowing, interest rate, your chosen repayment frequency and length of loan. Main goal of repayment calculator is to help you play with numbers and gauge the best repayment plan and understand the ratio of debt and repayments that you are going to be making. Loan Term Calculator - that one should simply answer the question how long it will take to pay the loan down. Or alternatively allows for current loan owners to play with numbers and see how changes to their current loan contract would alter the date they could call themselves loan free. Disclaimer: The results obtained from this Mortgage Repayment Calculator are indicative only and it is advised that you seek professional advice before considering your next Home Loan structure. Read full disclaimer.